Established in 2013 to provide high quality medical education. It is now based in The Greenway Building at Trafford General Hospital. The centre is equipped with state of the art adult, child and baby high fidelity simulators creating a realistic learning environment. The advanced human patient simulator can simulate challenging scenarios to develop clinical skills, team working and the ability to work effectively under pressure. Medical emergencies such as anaphylaxis, acute myocardial infarction, major haemorrhage and shock states can be demonstrated using the simulators to test individual and team responses. The scenarios are then discussed using sophisticated audio-visual equipment in an adjoining debriefing room. 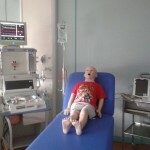 The simulators are accommodated in a multipurpose simulation suite. This area can be transformed to represent virtually any clinical location of the hospital, providing flexibility and realism to the scenarios. The simulated environment provides a realistic hospital environment, thus allowing healthcare professionals to rehearse management of clinical scenarios with no risk to patients. We have a control room and multi-angle audiovisual monitoring with live and recorded relay of action to any of our meeting rooms allowing us to stream live action to large groups. Monitors display the vital signs to enable participants to assess the patient's progress. Patient test results and x-rays are also displayed in the simulation suites. For effective debriefing we use audiovisual playback via StudiocodeTM. StudiocodeTM is a video analysis tool widely used to capture, tag, analyse and improve performance. Using this allows effective use of video in debriefing to maximise participant reflection on action. Debriefing clinical simulation experiences is increasingly understood as a crucial step in clarifying and consolidating lessons from simulations, empasis was placed on the debriefing aspect of the simulation experience when designing ManCEL to enable us to achieve this. The centre boasts a lecture theatre seating up to 36 people all fully equipped with video conferencing facilities. A large ward simulation area. several smaller teaching rooms, a private faculty room with kitchen. Also based at ManCEL is the Northwest Simulation Education Network (NWSEN).